This leaves Doc and George to head to Altura to rescue Dante or assure he has a fair trial. The bakery looks abandoned and is utterly utterly creepy. Super creepy. More horror films need to be filmed in abandoned bakeries. The creepiness quickly falls apart when we meet the bakers - a pair of Canadian brothers. 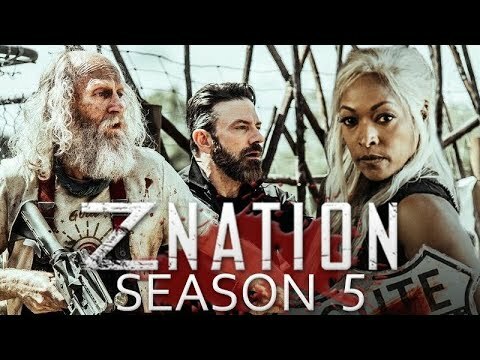 And, thank you Z Nation. My co-blogger Renee is, as everyone knows due to my many references to igloos, polar bear and moose, Canadian. This will give me YEARS of ammunitions, YEARS. So the two Canadian brothers are… not exactly competent or sensible and are walking comic relief. Addie and 10k easily take down one and then Warren and Murphy take down the far far more competent of the brothers. Duly subdued, the Canadians reveal that their mother came up with the recipe after their little brother was bitten and they became so popular they went into mass production. The problem is that their mother, and another brother, were all bitten and she’s the one with the recipe. In her pocket. They’re all now locked in the office. But she reveals that she hasn’t been making this recipe for a while and they get “enhanced flour” from the Hartland - and that lack of supply is what lead to the biscuits shortage and the whole family turning to Talkers with the shortage. So this has Warren & co heading to Hartland with Murphy taking the vulnerable Canadian family to Limbo to look after them. Another really meaningful scene is Addie and 10k talking about his missing hand - and with lots of prodding and poking Addie manages to make 10k talk about it, how it feels and how devastated he is by it. And how he is mourning his missing hand - Addie, a woman with one eye, can sympathathise and relate. It’s powerful, I applaud. George and Doc are driving to Altura and we have a nice moment - when Doc tells George not to put her feet on the dashboard because she could be hurt in an accident by the airbag and George is kind of bemused at this being something people worried about. Doc still has fears from before the apocalypse which seem cute now. And then they have an accident, George sprains her ankle and there is a lot of cannabis consumption and talk of politics. Which involves Doc, while stoned, explaining the founding fathers and the bill of rights to George. It’s vaguely amusing but bizarre. Who is Doc talking to here? Their presumably American audience who should know this stuff? (I mean, I’m European and I know this stuff). George? Who, as was explained this season, was in college when the zombie apocalypse. Presumably she already knows this stuff? She shouldn’t be shocked at the fact women didn’t get the vote from Founding Fathers or the gross injustice of slavery continuing long after the Constitution and Bill of Rights was signed. Who needs to know this? Why? Why is this being explained? And I can only assume that the writers of Z Nation assume their readers truly don’t know this? It goes on to be problematic by having George come to the revelation that people should care about Talkers because everyone will be Talkers some day - everyone dies. So by reducing rights for Talkers you’re inevitably going to hurt yourself. Which, yes, true - but at the same time if you’re going to make comparisons with real world prejudices try to not then work towards a solution which just doesn’t apply and shows how dubious the comparison is. They then find Dante’s dismembered body and George gives him mercy.